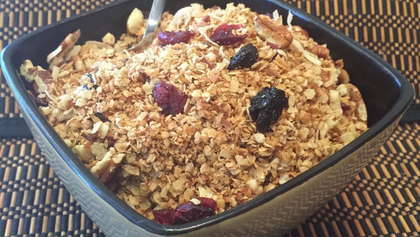 Stove top granola can be a perfect addition to your dessert or breakfast! Heat a large sauté pan over a medium heat and melt coconut oil, butter, vanilla and maple syrup. In a large mixing bowl add in oats, walnuts, almonds, sunflower seeds, cinnamon, salt & coconut. Gently toss until everything is well incorporated. Pour into sauté pan and cook for 8-10 minutes, continuously stirring, until oats and nuts are toasty and golden brown. Finish by stirring in dried fruit. Store in an airtight container or small zip lock bags.